These Costco stuffed peppers appeared recently in the entree section near the butchers (where the chicken pot pies are located). I believe these are assembled fresh at the local Costco. 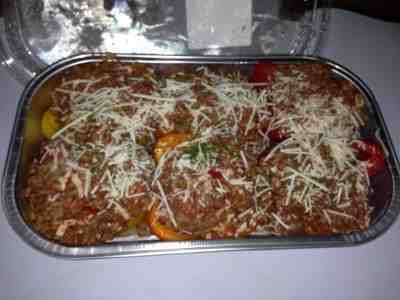 The stuffed peppers come six to a pack; filling is beef, rice, cheese and seasonings. The flavor is not "meatloafy" or overwhelmingly Mexican. We thought they were good enough that I've repurchased. I've tried stuffed peppers from scratch before and never been happy with the result, so I'm even more impressed with these. For the two of us, we made two complete dinners from the pack of six. 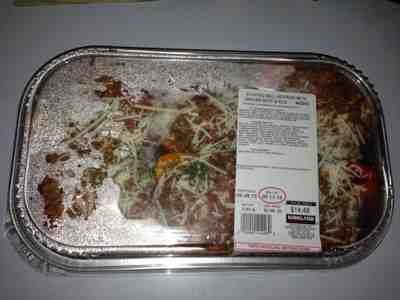 I cooked the entire pack and froze half for the second meal. Hard to get a good photo. Did they freeze well? Always want to buy but too many in a pack . How did they freeze ? So sorry I took so long to reply to this! My notification must not be working on my phone, where I orderinarly post from now. They froze fine, no problem. No Pink Salt in Nashville? Who eats that many green beans?